Last week I explored some ways to replace bad habits with new, more productive ones. Since habits can make or break your success, let’s delve a bit deeper into ways to make good habits your default setting. Strategically manage your habits’ activation energy. Mihaly Csikszentmihalyi, a pioneer in the field of positive psychology, coined the phrase “activation energy” to describe the amount of effort (energy) required to start a particular task. 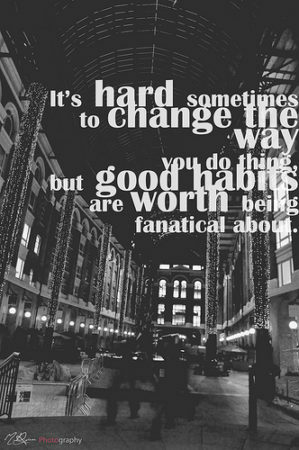 Habits, by their very nature, have an extremely low activation energy. It’s very easy to start a habitual activity, because we’re able to do it on auto-pilot. That’s good news when the habit enhances your productivity, but very, very bad news when said habit derails your effectiveness. So part of the solution to replacing bad habits with good is to raise the former’s activation energy and lower the latter’s. Start by reviewing the bad habits you identified in step one, then figure out what makes it so easy to slide into those activities. Do you have Facebook open every moment you’re at your computer or on your phone? Have you set email and text notifications to maximum volume? Does YouTube have its very own spot on your bookmarks toolbar? Honest answers to questions like these provide clues as to how to raise the activation energy of these time- and energy suckers. And actually doing so is pretty straightforward: keep Facebook closed during the workday, set notifications to silent, and un-bookmark YouTube…. You get the idea. The tough part is committing to doing so. Don’t forget the effectiveness-enhancing, positive habits you identified in step two. What can you do to keep the activation energy low for them? For example, meditation instructor davidji has a simple formula for making it easy to meditate daily. He calls it RPM, which stands for Rise, Pee, Meditate. He has committed to starting his day with nothing except a brief potty break between waking and meditating. By following this formula and teaching it worldwide, he’s enabled himself and thousands of students to develop a rock-solid habit of meditation – and to enjoy all the physical and mental benefits that come with it. Whether you’re dropping old habits or developing new ones, you stand to gain a lot. The challenge is to focus on the payoffs that resonate with you. For example, I can think about how my yoga practice lowers my blood pressure, strengthens my immune system, improves my balance, yadda yadda yadda. All of that’s true, yet what really keeps me doing yoga is the way people are surprised when I tell them how old I am. Ego based? Yeah. A yoga payoff I really appreciate? Oh, yeah. Get an accountability partner to keep you working on the new habits. This is one of the most powerful tools you can add to your repertoire. Just find someone who is as committed to creating positive change in her/his life as you are. Arrange to touch base with each other on a regular (at least weekly) basis to ensure that each of you is staying the course. The beauty of using an accountability partner is that tapping such a partner for help can itself become a habit. Ready to become more physically active? Arrange with your partner to walk together regularly. Tired of having great books sit on your office desk, unread? Join a book club. Can’t seem to get started developing that new product? Set up weekly virtual meetings with your buddy; work for an hour, report, work another hour, report; repeat until finished or until you’ve reached your agreed-upon stopping point. So what changes will you make to create a 2018 in which you’re more productive than ever before? Share your commitments and ideas in the comments section below. This entry was posted in choice and tagged habits. Bookmark the permalink.